California has hit a record for buyers striking all cash deals for houses, particularly on the ultra-high end. Apparently, some 31 percent of all buyers in California paid cash -- and the higher up you go in the price category, the greater that percentage. For example, 62.2 percent of people buying homes worth at least $5 million paid all cash. On the surface, this does not appear to be all that surprising. We've known for years that it is harder and harder to get a mortgage, especially if you are self-employed and can't produce a pay stub. The wealthier people in America tend to be business owners, so I suppose it makes sense that more of them would pay cash. Plus, California is one of the epicenters of the foreclosure crisis. Investors and homebuyers are jumping in to pick up properties they think are once-in-a-lifetime bargains. So that makes sense. But here's what I wonder. Rich people didn't get to be rich because they're stupid. Nor did they become rich throwing money around loosely. Investors in particular don't just go plopping down a couple of million bucks on a whim; they tend to think about those decisions pretty carefully. So what do they know that the rest of us don't? I think one answer is that the very rich believe inflation is headed our way. And how. to increase the supply of money -- e.g., QE 2, which is not a large boat, but "quantitative easing, the second round", which injected some $600 billion of money into the economy, scratch that, into the big banks. Another way to read "barrage of monetary policies" is, "printing money". Over the same few months, average consumers have noticed a few things. For one thing, every time they go to the gas station to fillup the family minivan, the receipt gets more and more troubling. And trips to the grocery store are getting more and more expensive too. CNBC reports that the price of butter is up 27 percent over last year, coffee is up 12 percent, bread is up 3 percent, and the price of meat is up 11.1 percent. I can't have breakfast anymore! And buried in boring economic stats is the news that commodity prices are up across the board too: up some 7 percent this year, driven by higher oil prices. But the price of steel, for example, is up an incredible 37 percent since November of last year. Houses tend to use some steel. The price of timber is also up. Plastic prices are up. Of course, you have quite a few serious people who think that what the U.S. government is doing, between Bernanke's printing hundreds of billions -- sorry, quantitative easing -- and Obama's borrowing trillions -- sorry, fiscal policy, is to devalue the dollar. Most of us ignore such people. But I suspect that the very rich do not. They have highly paid investment advisors, private bankers, hedge fund managers, and other very rich friends, all of whom talk about Fed policy, global commodity prices, and currency trading the way we might talk about who won the Oscars for Best Supporting Actor, and who the hell is Arcade Fire. 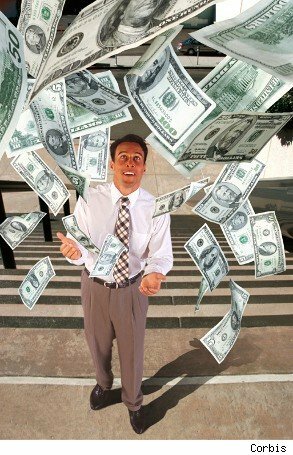 If you're a very rich guy, and have a few million in cash lying around, and you're expecting inflation as reflected by commodity and food prices -- as opposed to the official government figures which exclude those -- then you're staring at your money being worth maybe 10 percent less next year than it is this year. House prices are depressed, and have some more to go, but say you find a beautiful McMansion for $3 million in foreclosure that went for $5 million three years ago. You're hearing about timber prices, steel prices, building supply manufacturers all raising prices, and so on. You might want to drop $3 million cash on that house too. A year from now, that will only be $2.7 million, after all. Instant "discount"! Good for you, Mr. Richie Rich. Plus, land does tend to hold value over the long run, and people do have to live somewhere. Real estate, if you can get it at the right price, and avoid rent control socialist paradises, could be a very nice inflation hedge. 1. If you believe that inflation is coming, and can buy (a major assumption given how hard it will be to get a mortgage in the first place) -- do it. Real estate should hold its value better than, say, cash. 2. If you're having to sell, then think about what you're actually going to do with that money from the sale. If you're planning on holding it, and you expect inflation, um... well... talk to your financial advisor. 3. If you don't have to sell the house, it might not be a bad time to become a landlord, assuming there aren't any rent-control issues. Rents will go up with inflation, even real inflation. The 30-year fixed-rate loan you've got, won't.